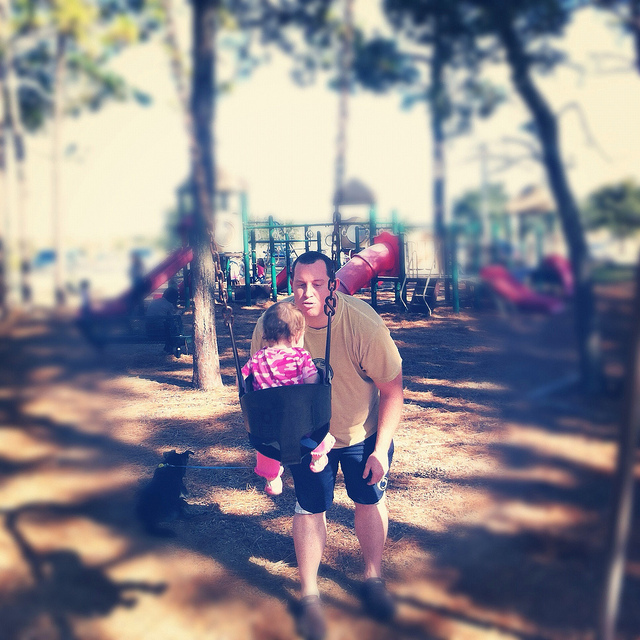 AAA State of Play Blog: Papa Play Awards: 5 Twitter Dads Who Are Awesome Advocates for Play! Papa Play Awards: 5 Twitter Dads Who Are Awesome Advocates for Play! What is your father like? My dad is compassionate, hilarious, and playful! I owe a lot of my enthusiasm for life to him. With Father's Day approaching, I wanted to take the time to honor fathers who deliver joy to children across the globe through the power of play. I actively follow these Twitter dads who each offer a unique perspective on fatherhood, parenting, and play. I learn so much from them, and I am certain you will too! While he advocates for everything from bike-friendly lanes to equal access playgrounds, James Siegal also serves as the president of KaBOOM!, a non-profit play advocacy group. He's also a dad. No matter how busy he is, he is devoted to his mission of creating communities that are bursting with playability. With KaBOOM!, he builds playgrounds and "integrates play into routine spaces like sidewalks and bus stops". In 2008, Mike Johnson established a fun and functional website to help dads find a happy, healthy work-life balance. His goal is to help fellow fathers work smarter so that they can dedicate as much wholesome time to their children as possible. Such a wonderful idea! Playground Dad provides tech, events, stories, advice, and inspiration so that fathers can live by the motto, "make sure we're not just showing up, but we're spending better time." Browse the website and follow Mike's twitter feed for motivation, laughs, and heartwarming tales of family time well-spent! Daycare is far more than just a "mom" thing. At Dad Adventure Day Care, play is the foundation for success. This fun, adventurous father understands just how vital play is to a child's growth and wellbeing. Through his empowering and knowledgeable tweets about childhood, Mike serves as an active role model for children. Plus, he shares tons of joyful, smile-sparking pictures of kids at play! Alex Smith is a champion advocate for providing more play opportunities in public spaces. He is spearheading the civic movement known as "PlayGroundology". On his blog, he explores many compelling topics, such as the value of healthy risk during play, the need for freedom to roam outdoors, and playgrounds around the world. I love spending time there; it is a treasure trove of knowledge and inspiration! His tweeter feed is also bursting with creative ideas and insightful articles. If you want to be delighted and inspired, check out his vast collection of playground pictures from all over! In 1995, Darrell Hammond read a story in The Washington Post about two children who suffocated while playing in an abandoned car because there was nowhere else to play. This tragedy compelled him to create KaBOOM! with his friend Dawn Hutchinson. His mission was to address the need for safe, accessible playgrounds for children everywhere. KaBOOM! has informed me that they have "built, opened, or improved nearly 16,300 playgrounds" and announced 241 playful cities for 2015! This is so outstanding. Their efforts have enhanced the physical, emotional, and social wellbeing of countless kids. Please consider donating! As we celebrate Father's Day this month, let's honor the dads and father figures who help make the world a more vibrant, enriching, and playful place! What fun memories do you have with your dad? The ABCs of Why Play Matters!